A beautifully framed magnetic board turns everyday notes and messages into an ever evolving work of art. It's a great way to add function to your home without sacrificing style. This high quality, 100-percent real wood decorative magnet board features a whitewashed, distressed frame with distinctive outer edge accents. The finish is creamy white with tan distressing and weathered patches. It is perfect for shabby chic, coastal, or casual beach decor. 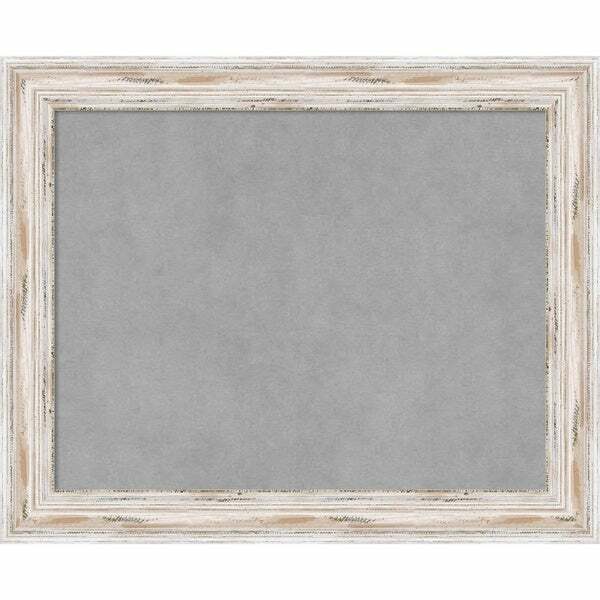 This magnetic board is handmade in a small custom art and frame shop in the American heartland - you can be proud to display it in your home. Perfect! Very well made. Great color. Packaged so that there would be no damage in shipping. Already wired in back for hanging and even came with the hook to put in wall! Highly recommend! My daughter loves this in her room so she can hang what she want on the walls with out making a mess to the walls. "If I order a 27 x 27 frame what is the actual display size.? I am looking to hang 2 scrapbook pages each 12 x 12." The 27-inch option has the magnetic area of 22 inches x 22 inches. The 29-inch option might work better as the magnetic area is approximately 24 inches x 24 inches. The 31-inch option would have a 26-inch magnetic area.